Board books are often one of children’s first experiences with literature. Young people chew them, cuddle with them, and yes, read them. They serve as an introduction to what many caregivers hope will be a lifetime of reading. They help children make sense of the world. Creating successful board books is no easy task given their limited format, length, and broad audience (they must be enjoyed by children and, at minimum, tolerable to adults, even upon their thousandth re-read). This challenge increases when a book is about a complex topic about which audiences will have varied opinions and experiences. 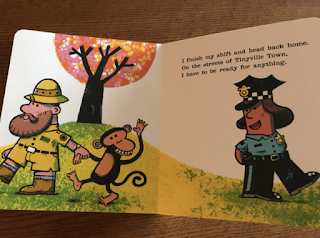 I thought of this challenge when I first saw Tinyville Town: I’m a Police Officer, written and illustrated by Brian Biggs. I also thought about Amy Martin’s post, “Rethinking Books about Police” and the police book evaluation toolkit created by the Oakland Public Library. A book about a police officer for young readers is an ambitious topic, especially considering the racism, mass incarceration, and police violence in our world. In its Kirkus review, this book is described as “A worthy introduction to the concept of police officers,” so I was interested to see how this book might follow the pattern of the other Tinyville Town books (such as I’m a Librarian) while also setting itself apart. a monkey eating bananas and donuts. The book opens with a Black police officer and her cat, waking up and heading out for their day. Her fellow officers have different skin tones, as do the people in their community of Tinyville Town. The officer is shown rescuing a cat from a tree and making sure a girl doesn’t slip on a banana peel. When the bakery and grocery store are robbed, she searches for the culprit: “Big ears. Long tail. Likes bananas and donuts.” As she follows the clues (and readers recall a White, bearded zookeeper putting “missing” posters up throughout the book), the “perpetrator” (not “suspect”) is shown having a picnic. The robber—a monkey—smiles wide as the White zookeeper pulls it away (off the page, presumably back to the zoo). The officer heads back home for a good night’s sleep. to the police officer as it is taken away. 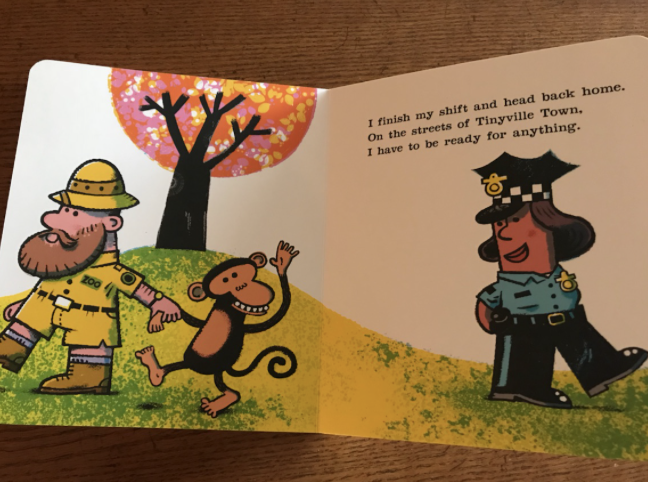 I am deeply troubled by the perpetrator in this book being a monkey. The police force kills a disproportionate number of Black people in this country, and there is a racist history of comparing Black people to monkeys (as explained by Wulf Hund and Charles Mills here). I’m sure some readers will say that I’m reading too much into this—that an animal is just an animal. But of all the non-human characters from which one could choose, it is a monkey, and it is important to remember that monkeys have been used throughout history to dehumanize Black people and justify genocide. Conversations continue today about this type of imagery, as seen this week when the clothing company H&M apologized for posting a photo of a young Black model in a hooded sweatshirt with the words “Coolest Monkey in the Jungle." Furthermore, for the suspect to return to the zoo sends a message to readers that those stopped by police are brought to places where they belong. Right now New Jersey prisons are trying to ban Michelle Alexander’s The New Jim Crow, and schools in Texas are trying to prevent students from reading The Hate U Give by Angie Thomas. These stories and messages do not exist in a vacuum, and neither does this book. I am sure that the team that worked on this book did not intend to have those connections drawn. The “messy thief” monkey is in the book all the same. I do not believe one book has to do everything, nor do I think I can predict how every reader will react to every text (consciously or unconsciously). Some readers aren’t even speaking, so I’ll never know exactly what they are thinking in the moment. But just because readers don’t express their feelings through speech doesn’t mean that they aren’t paying attention and growing in understanding of their surroundings, their literature, and themselves. They’re taking it all in. What messages are we endorsing as they do so? What a coincidence--that book landed on the Link+ shelf for me today. "Does this book contain racially coded images and language connected with implied guilt? For example, is suspicion cast on a black or brown character because of their appearance, or is their behavior described or characterized as suspicious?" "How does the author of this book refer to people being pursued by police? Many children's books refer to people being pursued with language implying guilt, such as "criminals" or "bad guys." However, US laws protecting due process render such terms inaccurate, as people being chased by police have not been proven guilty in a court of law. People being pursued or arrested are suspects." I avoided buying this one for OPL until we could look at a copy in person, and I'm glad I did. This one doesn't display the "Relevance to the experience and contributions of diverse populations" we include in our criteria for selection--see our collection development policy. Thanks for this review, Elisa. You're 100% correct in your observation on this book. There are probably a lot of people who would tell you that you're reading too much in the fact that a monkey was the villain. The fact of the matter is that in a perfect world, the bad guy could be a monkey and it would be fine. But this isn't a perfect world. This is a world where a president's wife was called an ape in heels. This is a world when a child was chased by police and had guns drawn on him because he was mistaken for an adult. This is a world where black people are shot sitting in their cars, selling CDs, and crossing the street. This is a world where a man walked into a black church and opened fire. In this world that we live in today, don't make the monkey the bad guy... even if the cop has brown skin. I feel you are putting an adult lens on this. A young child (which is the target audience) won't have the worldly experience an adult has. My pre-school students loved the monkey in this story. I think sometimes reviewers project their prejudices on a story that the target audience doesn't have.